The U.S.-Cuba rapprochement has returned the Summit of the Americas (SOA) to the way it was before George W. Bush turned it into a forum in which the U.S. was increasingly isolated – a community of vibrant but respectful debate reflecting the varied perspectives of the hemisphere. The event in Panama this past weekend was dominated by Cuba’s attendance at its first SOA and Presidents Raúl Castro and Barack Obama’s cordial public encounter and hour-long meeting, the first of its kind between the two nations’ leaders in over half a century. The next step in improving relations will be for Obama to formally announce Cuba’s removal from Washington’s list of “state sponsors of terrorism,” which the State Department reportedly recommended last week. Regrettably, the leaders did not take advantage of the Summit as an occasion to announce a target date for the formal restoration of diplomatic relations and the appointment of Ambassadors. But that, presumably, will come soon, and regardless, in the plenary session Obama set a new tone for U.S. policy when he acknowledged that “the days in which our agenda in this hemisphere so often presumed that the United States could meddle with impunity — those days are past.” Obama clearly articulated a desire to move beyond not only the legacy of U.S. intervention in the region but also the stale ideological debates that, he observed pointedly, pre-dated his birth. Statements and activities surrounding the SOA also reaffirmed the broad range of perspectives in the hemisphere, including in attitudes toward the United States. 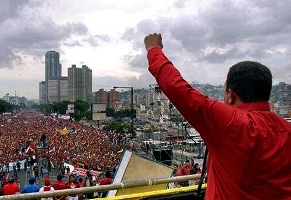 The “People’s Summit,” held parallel with the SOA, provided a forum for left-wing critiques aimed primarily at U.S. meddling in the region, in particular its foreign military bases and its recent allegation – which it subsequently backed away from – that Venezuela poses an “extraordinary threat to U.S. national security.” The sanctions it imposed on senior officials drew critiques from around the region, including from Argentina, Colombia, and from Brazil’s Dilma Rousseff, who summarized regional sentiment in characterizing them as “counterproductive and inefficient.” The criticism was overshadowed, however, by widespread applause for changes in U.S.-Cuba relations. Obama also won points from observers for meeting with Venezuelan President Nicolás Maduro, who used the Summit to denounce the 1989 U.S. invasion of Panama and present to Obama a list of 11,000 signatures opposing Washington’s sanctions. 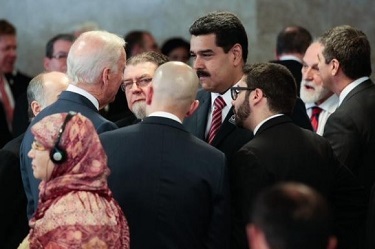 Maduro praised the meeting as the “Summit of Truth” and even “cordial,” noting that it opened the door to further discussions on the bilateral relationship. Obama also seemed to subscribe to a different role for civil society representatives – as opponents of sitting governments – at the summit, choosing to meet privately, for example, with Cuban dissidents opposed to the Raúl Castro and his government. Obama’s steps to remove the festering U.S.-Cuba issue from the hemispheric agenda have been game-changing, even if some presidents criticized Washington’s continued enforcement of the economic embargo and the Administration’s bewildering inability to move faster to remove Cuba from its highly politicized terrorist list. This summit may signal a return to the values and respectful debate that Obama, and before him Bill Clinton, espoused at past Summits, and may pave the way for cooperation over contemporary issues rather than Cold War-era ideological hang-ups. In the final days before the Summit, senior White House advisors had intervened to ease tensions over the State Department’s national security rhetoric vis-à-vis Venezuela, emphasizing with regret that assertions regarding Venezuela’s posing a security threat were an unfortunate procedural necessity rather than a genuine assessment of the situation. This recognition that “words matter” turned on their head the words used earlier in the week by Assistant Secretary of State Roberta Jacobson in lamenting that Latin American governments were not using language similar to Washington’s to characterize the deteriorating political situation in Venezuela. While the correctives from the White House and the focus on the transformation of U.S.-Cuba relations were both conducive to a successful SOA, these developments did overshadow both the official theme of this year’s summit – Prosperity with Equity – and related discussions on energy, the environment, and education. These crucial issues, all ripe for regional cooperation, are the core of what should become the focus of U.S.-Latin American relations for the remainder of this administration and beyond. Panama: A Central American Singapore? As a transportation hub, logistics center, and regional financial player, Panama has long been painted by investment bankers and Panamanian politicians as a potential “Singapore of Latin America,” but that vision still seems a way off. In some respects, Panama’s story has been quite impressive. For a decade, it has boasted GDP growth far beyond the regional average, even surpassing 10 percent in some recent years. Unlike many of its neighbors, its dollar-based economy relies on services, not exports of commodities or low-value-added light manufacturing. Since the 1989-1990 U.S. invasion to unseat General Manuel Noriega, the total size of the Panamanian economy has quadrupled in constant dollars. It is also different from Singapore in important ways. Singapore’s approach to planning and public housing might be helpful in Panama City, which has suffered traffic, environmental degradation, and inadequate housing for the poor as a consequence of poorly planned growth. In other important ways, however, the Panama-Singapore comparison is less apt. Singapore is a city, with nearly two million more people than Panama has spread across 100 times the landmass. Urban-rural divides are wide in Panama, with poor delivery of health and education services outside the cities, exacerbating inequality. A Singapore-style strategy in Panama would leave the countryside behind – and indigenous and Afro-Caribbean populations would benefit much less. Differences between the two countries in governance – for better and worse – are profound. The Panamanian people are much freer under the country’s democracy than they would be under a single-party-dominated system like Singapore’s. In other ways, though, Panama’s governance leaves much to be desired. Corruption is a massive problem, and watchdog groups highlight weakness in the rule of law, judicial independence, and press freedom. Projects to expand the Panama Canal and build a capital city subway are over budget and behind schedule, and have suffered from strikes, contract disputes, and questionable bidding practices. While it may seem easy to blame the corruption on former President Martinelli, who faces criminal charges, the problem has much deeper roots. The two countries have very different policies toward education. Singapore invested, and continues to invest, heavily in world-class universities. Panama lacks these, weakening its ability to compete globally in industries where innovation is key. While Panama’s primary education has improved, its research and development lags. A final difference is where the countries find themselves in their political and economic evolution. Singapore became independent 50 years ago, but it has been only a quarter century since Panama ended its kleptocratic, military rule. It has been just 15 since the United States officially turned control of the canal over to Panamanian authorities. The roots of its problems cannot be easily or quickly extirpated. Panama’s boosters often use the comparison to highlight the areas in which Panama excels – economic growth, unique geography, and infrastructure crucial to global shipping and air transit. The comparison might be more helpful in highlighting areas where Panama needs to improve. These include dedicating resources to higher education and R&D, addressing inequality, rooting out corruption, and enhancing political and bureaucratic accountability. 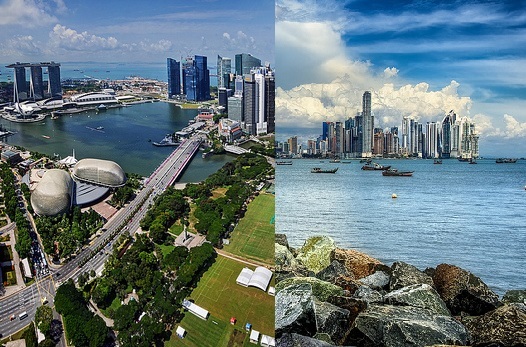 Singaporean scholar Alan Chong argues that Singapore’s attempt to present itself as a model, global city is in part a foreign policy strategy of “virtual enlargement.” The city-state’s wealth, reputation, and active role in international organizations allow it to “punch above its weight” in Southeast Asia and beyond. Some chapters of Panama’s recent economic story might be the envy of neighbors with their own canal dreams, but the country will need to focus on governance and accountability if even its logistics-hub strategy is in fact going to deliver shared welfare at home and enhanced influence abroad – let alone become a Latin American equivalent of an Asian Tiger. * Dr. Long is a visiting professor in International Relations at the Centro de Investigación y Docencia Económicas in Mexico City. He is the author of Latin America Confronts the United States: Asymmetry and Influence, which is forthcoming with Cambridge University Press. 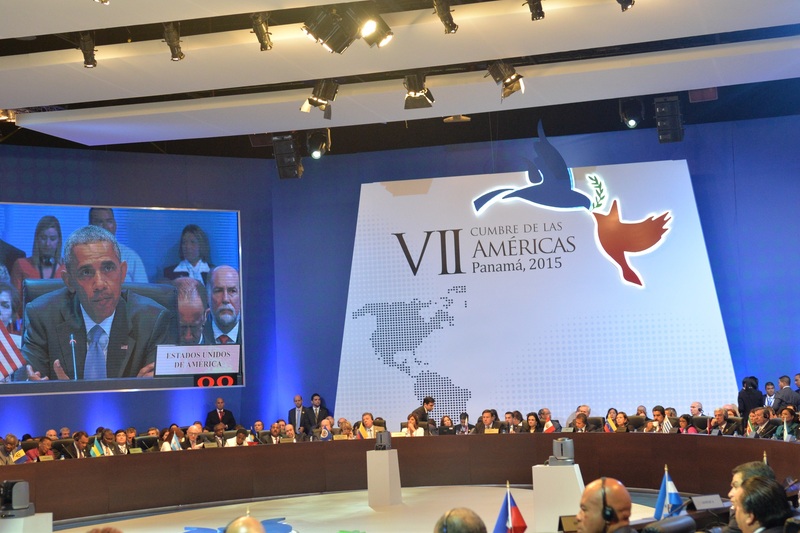 Who Will Attend the OAS Presidential Summit in Panama? Asked “is there a chance that the U.S. might refuse going.” Again, I think you won’t be surprised to hear me say that we’re really not going to answer hypotheticals in the future yet. Obviously, the Summit of the Americas is in April and that’s not a situation that we can answer, although I think we have made clear that we believe the summit process is committed to democratic governance and we think that the governments that are sitting at that table ought to be committed to the summit principles, which include democratic governance. And therefore that’s our position at this point. Obviously, we have a position on Cuba which does not at this point see them as upholding those principles. Panama’s likely invitation to Cuba – reflecting the consensus of 32 hemispheric nations at the last Summit – will draw protests from official quarters in Washington. But it’s far from certain that the Obama Administration would risk blame for torpedoing the 20-year Summit process. Obama survived a handshake with Raúl Castro at Nelson Mandela’s funeral last December, and being in the same room with him again as a President in the second half of his second term will have little political consequence. A workshop in Mexico City in June, in which CLALS researchers participated, and another in Ottawa in September, sponsored by the Center and the University of Ottawa, explored likely outcomes. Mexican international relations specialists speculated that a reasonable outcome was for the United States to show up like a polite guest, and thus avoid having the anachronism of U.S. antagonism toward Cuba overshadow its broader relations with Latin America. 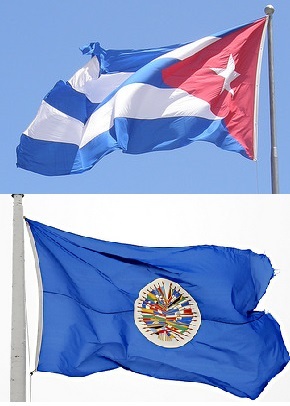 Canadian experts were deeply concerned that Cuba’s inclusion might undermine the centrality to the OAS of the Inter-American Democratic Charter, but they agreed that failure to convene a Summit would constitute a serious blow to the OAS and to the regular summits that provide Canada a seat at the inter-governmental table. The reality is that Cuba does not conform to the Democratic Charter or to the broader OAS criteria of democratic rule, but equally real is that Latin America sees Cuba as a full member of the hemisphere and has lost all patience with those in Washington who would deny that. Either Washington — and Ottawa — set aside their objections to Cuba’s inclusion or they bid farewell to such fora and their constructive impact on regional relationships that ought to matter to them. Moreover, if they acquiesce to Cuban participation but then try to commandeer the agenda and make the Summit a seminar on democracy and human rights, it will only reinforce the widespread sense in the region that Washington cannot move beyond its obsession with the trivial matter of Cuba and get on with a serious conversation among equal partners. They would thus sacrifice an opportunity to discuss issues on which significant, substantive advances are possible through dialogue among leaders of countries throughout the hemisphere. The value of the Summit rests with the capacity of all involved to act like grownups. President Obama did so at Mandela’s funeral, and it will be telling whether he can do it again in Panama this coming April. Trans-Pacific Partnership: A Framework for U.S.-Latin America Relations? President Obama’s desire to move forward with the Trans-Pacific Partnership (TPP) appears likely to founder amidst Congressional resistance to granting him “fast-track” authority, but it does signal a noteworthy initiative by an administration eager to grow trade relations with some Latin American countries. Originally formed by Chile, New Zealand, Brunei and Singapore in 2006, TPP is currently negotiating the accession of five new members, including the United States and Peru. Mexico, Colombia, Costa Rica, Panama, Canada, and Japan are also considering joining. U.S. Undersecretary for International Trade Francisco Sanchez said last year that agreement on a framework for the United States to join TPP represents “a landmark accomplishment because it contains all of the elements of a modern trade accord.” It eliminates all tariff and non-tariff trade barriers; takes a regional approach to promote development of production and supply chains; and eases regulatory red tape. 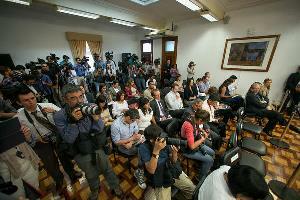 The White House’s senior official responsible for Latin America has also emphasized the importance of the Partnership. The Administration for the most part has tried to sell the pact as a domestic economic issue – the argument being that more trade and harmonized regulations translate into more jobs – or as integral to a strategic focus on strengthening economic ties to the dynamic economies of Asia, rather than as a policy that has the potential to redefine economic relations with Latin America. But lobbying on Capitol Hill has so far been ineffective, and Obama’s own Democratic Party has denied him the “fast-track authority” needed for an effective negotiation. The Administration’s diplomatic strategy has not progressed smoothly either. During Obama’s recent four-nation swing through Asia, he and Japanese Prime Minister Abe failed to sign an agreement widely seen as crucial for moving ahead with TPP. Negotiators from all 12 TPP countries met in Vietnam last week, and – despite claims of progress – press reports generally suggest a gloomy prognosis for progress soon. President Obama has made much of his “pivot” to Asia, and the push for TPP situates Latin America relations in Washington’s wider foreign policy agenda. The emphasis on the TPP signals that liberalizing trade remains the core principle guiding U.S. thinking about economic relations in the hemisphere, in effect continuing a paradigm that has reigned for decades and that is embodied by proposals such as the now-abandoned Free Trade Area of the Americas. Unable to secure broad South American buy-in for that U.S.-minted vision for economic cooperation, the administration seems to have settled on trying to work with a “coalition of the willing” comprised of Chile, Colombia, Mexico and Peru. For governments elsewhere in the region, however, the not-so-particularly-new approach has elicited scant enthusiasm. One could imagine ambitious proposals from Washington for hemispheric cooperation around energy, climate, infrastructure, technological innovation or even, eventually, labor market integration. But that would require visionary leadership, a commodity that is in strikingly short supply nowadays in the U.S. capital. Rather than leading the articulation of a novel, shared agenda for a 21st century economic transformation of the Americas, Washington has chosen for now to repackage the last century’s prioritization of trade. The Port of Mariel – long associated with a boatlift in 1980 that brought more than a hundred thousand Cubans onto U.S. shores – could either help launch Cuba into a new regional role as a shipping/trading hub or be yet another white elephant project. This irony was noted in a recent New York Times piece, which portrayed the venture in an optimistic light. 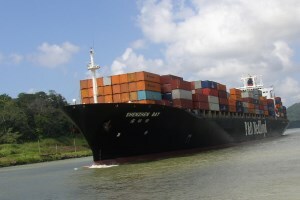 According to some observers, the massive port upgrading that is underway there at the moment, with Brazilian funds and a leading Singaporean port operator slated to operate the venture, is a ticket for Cuba to thrive in the 21st century as a vital logistics hub, funneling goods to Europe, the Greater Caribbean and, eventually, the United States. All of this is on the agenda because of the Panama Canal expansion that will allow for post-Panamax ships to transit the canal. These ships will have the capacity to carry over twice the amount of cargo than the current vessels that transit the canal, thus re-routing trade that now travels from the west coast of the U.S. by land to the east coast, and at the same time expanding traffic from Asia on to Western Europe. The $957 million Mariel project entails a Brazilian investment of $682 million with the rest of the financing coming from Cuba. The ambitious project goes well beyond the port itself, as the Cuban government has taken the exceptional step of authorizing a surrounding free trade zone – essentially an export processing zone along the lines of those that have housed maquilas throughout much of the Greater Caribbean as well as in regions such as Guangdong, in China, which became an export powerhouse. The notion is that industries that locate within the special economic zone around Mariel will enjoy 50-year, renewable contracts and numerous beneficial tax treatments, including tax-free processing of imported inputs into products that will in turn be shipped out through the state-of-the-art port. For some analysts of Cuba’s economic development prospects, this is a historic opportunity, one that will become even more relevant once the U.S. embargo finally goes away. By this account, a combination of geographic location and a highly skilled workforce places Cuba in an ideal situation to take advantage of these massive investments. If the Mariel initiative were to work as envisioned, the result would be a massive increase in industrial employment in Cuba which, under this scenario, could become a high value-added manufacturing hub and a distribution point for goods transiting from Asia to the greater Atlantic. The opportunity may be all the more exciting given the failure of the U.S. federal government to invest in port upgrading of a sort that a well-functioning capitalist state would undertake. At the moment, The Economist reports only Baltimore and Norfolk have the capacity to accommodate post-Panamax ships, leaving the field open for newcomers such as the Bahamas (already equipped) and Havana (about to be so). Other analysts observe, however, that the project faces severe constraints, ranging from the institutional bottlenecks in Cuba to the reality of competition from other deep water ports (which do not suffer from the sclerotic institutional environment that plagues so much in Cuba), as well as competition from other countries with highly skilled workforces (Costa Rica, the Bahamas, and much of the English-speaking Caribbean). Nevertheless, critics in Cuba and abroad question whether the massive Brazilian investment in the project – essential to its success – is driven not only by economic opportunities but also by the domestic political calculations of President Dilma Roussef. Loans provided to the Brazilian engineering conglomerate Odebrecht to build the port are from the Brazilian development bank, BNDES, and guaranteed by the Brazilian state, so unlike EU companies that eschewed investment in Mariel, Odebrecht incurs minimal risk. Mariel represents both a geostrategic and a domestic political calculation by the Dilma government. Brazil is happy to take advantage of the U.S. absence in Cuba to build the port and its relationship with Cuba. 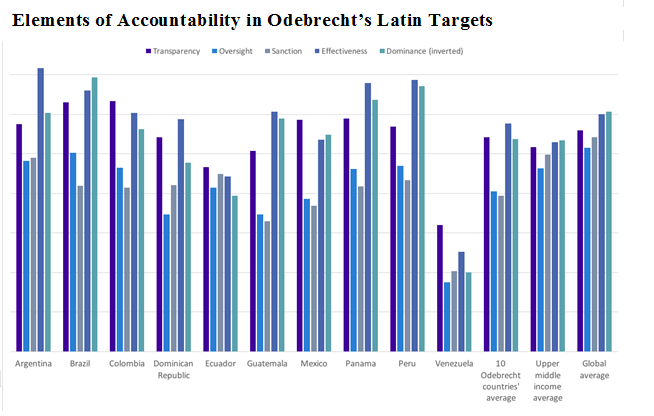 At home, it allows the government to reward the construction firms – such as Odebrecht – that are consistently the largest campaign donors in Brazilian politics. It also helps to slake the passions of factions of the left that seek closer ties to Cuba, and have been disappointed by the Dilma and Lula administrations’ relative political moderation at home. The fortunes of Mariel may in the end reveal as much about Brazil as about Cuba.